The exterior of the Mendez Mansion, 1986. 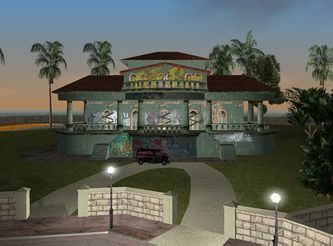 The Mendez Mansion refers to one of three mansions found on the northern half of Prawn Island, Vice City, in Grand Theft Auto: Vice City and Grand Theft Auto: Vice City Stories. Originally unnamed in GTA Vice City, the mansion is retconned in GTA Vice City Stories to be owned by Mendez Brothers, serving as their base of operations, assets and residence circa 1984. In 1984, the year in which the events of Grand Theft Auto: Vice City Stories takes place, the mansion is owned by Diego and Armando Mendez, also known as the Mendez Brothers. The mansion serves as their base of operations, residence and a valuable asset. The mansion is still in its beautiful state along with the other two beside it. Missions done for the Mendez Brothers are started/triggered at the Mendez Mansion. After the deaths of both Diego and Armando Mendez at the hands of Victor Vance, the mansion fell on the hands of the local Sharks gang. The mansion had a rotunda, swimming pool, basketball court and a tennis court. At one point in the game, a Domestobot operates in the mansion to do chores; during "Domo Arigato Domestoboto", the player seizes control of the robot to crack a safe in the mansion; this is the only time in the game when the player can explore the upper interiors of the mansion. The Mendez mansion would serve as the starting point for missions given by the Mendez Brothers, and is also the central flashpoint during "Light My Pyre", when Lance Vance and the player charge in in a failed attempt to save a kidnapped Louise Cassidy-Williams, although Victor succeeds in killing Armando in the mansion's (unusually) spacious basement level in the process. The killing sends Diego seeking refuge at the Mendez Building, leaving the Mendez mansion abandoned, which at an unknown time was then taken over by the Sharks. Two Sentinel XS vehicles are always parked outside. In 1986, the year in which the events of Grand Theft Auto: Vice City takes place, the mansion is now abandoned, torn down, run-down, in a state of disarray and vandalized by the Sharks with the other two recklessly torn-down in similar fashion. The mansions are a shadow of their past splendor. A Gang Burrito spawns at the front of the Mendez Mansion., Unlike its two neighbouring mansions, the player can not enter the Mendez Mansion without the use of Modifications and trainers. The Mendez Mansion, along with its two neighbours, plays a major role in the Ricardo Diaz mission Phnom Penh '86. In the mission the player, seated in a Maverick helicopter piloted by Lance Vance and wielding an M-60 machine gun, launches an all out assault on the Streetwannabe's stronghold among the Prawn Island mansions, gunning down defending Streetwannabe's thugs in all three mansion compounds, with the Mendez Mansion serving as a major battleground. The backyard of the Mendez Mansion, 1986. Exterior of the the Mendez Manison, 1984. The Mendez mansion's backyard, 1984. This page was last modified on 8 December 2013, at 13:45.